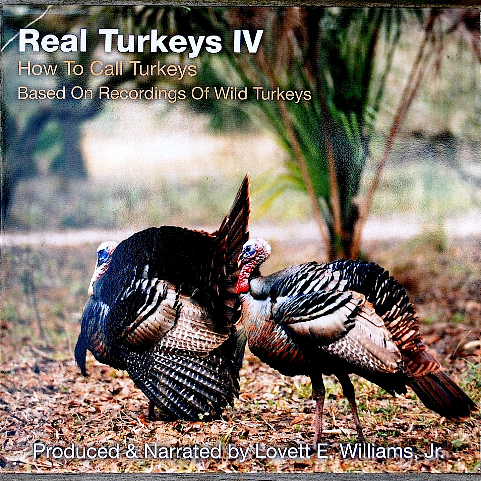 Real Turkeys IV: “How to Call Turkeys” presents recorded examples of the wild turkey’s calls used in hunting. The examples include the lost whistle, kee-kee & kee-kee-run, the unique kee-kee-run of the jake, calling by the hen to silence her brood, assembly yelping of the hen, lost yelping of hens and gobblers, alarm putting, plain clucking, plain yelping of hens in spring and plain, and other calls used and heard in hunting. The instructional narration covers spring hunting as well as fall hunting and answers to the most frequently asked questions about how to call in wild turkeys. This is the most instructional of the recordings in the Real Turkeys series.